You will now be prompted to choose a backup server for the backup job report submission. And right after you will be asked to enter the e-mail address you wish the backup report to be sent to. The last step is to assign a backup Id and backup description to the just configured job. Try to choose something short as the Id, also something that can be sorted numerically or alphabetically, i.e: 001, 002, 003. There's a 5 character limit in the length of the backup Id and a 40 character limit on the description field. 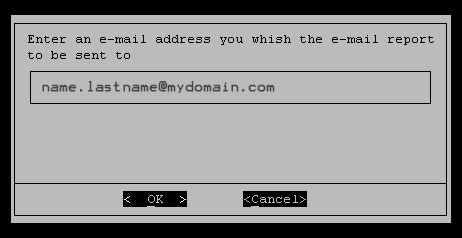 It has been thought to enter user defined codes following a convention. You have the description field to add more descriptive information. 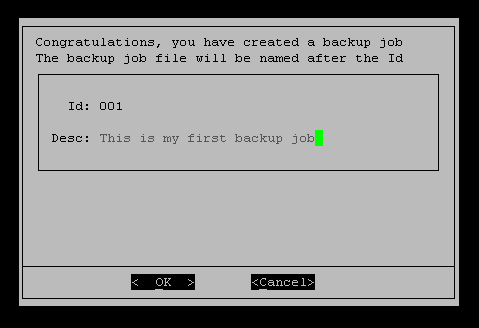 Once you have created backup job and it has been added to the /jobs folder, you can edit it with the GUI. The process is exactly the same as creating it. You will be taken through the same screens than when you created it, but this time some values will be preselected. You must be careful not to change some value unadvertedly when editing jobs with the GUI. Another way to edit backup jobs is by editing the backup job files stored at the /jobs directory. You will see all commands, as explained in the Man Page there, one per line. You can edit values and change them as desired, in any case, you have to take on account that, when editing manually you will necessarily need to type commands as the program expects them, as in this case imput will not be filtered by the GUI. Visit the Man Page to check whatever configuration value you may doubt about.